Meanwhile, the Ruler of the Nishadas who was returning to his kingdom after accompanying Rama for some distance into the forest, saw the Minister Sumanthra sitting in his chariot on the bank of the Ganga, the horses having been tied by their reins to a shady tree. Guha found Sumanthra weeping and wailing inconsolably, alone. Guha himself could not control any longer the anguish he had restrained so long. He cried out, 'Rama', and ran towards Sumanthra. He embraced the old man and both sobbed aloud in agony, unable to put their grief in words. They stood under the tree together, but fell on the ground as if they were themselves trees felled by an axe. They lamented the fate of Sita, Rama and Lakshmana and poured abuse on Kaikeyi, the cause of all the calamities. The horses stopped grazing, and desisted from drinking water. Tears rolled from their eyes. Whenever they heard Sumanthra and Guha utter the names of Sita or Rama, or Lakshmana, they raised their heads aloft, and peered into the distance, anxious to catch a glimpse of those whom they adored and loved with as much zeal as the two men in the agony of separation. Sumanthra noted the grief which was tormenting the animals and his anguish became even greater. Some hours must have passed by this heart-rending wail. At last, Guha managed to recover a little; he mustered some courage, as needs some one must; he addressed Sumanthra thus: "Ah, Minister! You are profoundly intelligent, steadfast in morality and a person who has identified the Reality behind all this passing show. Fate plays strange tricks, and so, one has to learn to put up with them. Rise! Return to Ayodhya! Convey the news to Kausalya and Sumitra, who are yearning to see you and to listen to your account." He raised Sumanthra forcibly from where he had fallen. He seated him in the chariot. He brought the horses and yoked them to the central pole. Sumanthra realized that what Guha was insisting was the correct step. Moved by a spurt of blind courage the old man signed to the horses to move forward; his body lost strength as a result of the anguish of separation from Rama. Therefore, however much he tried he could not drive the chariot as of old. He rolled down inside the chariot and rose in his seat many times in a few minutes. And the horses? They too would not move. They were set on turning back and straining their necks to see the road behind. Sumanthra cursed himself and his fate. "Fie on me", he said. "May this horrid life of mine be ended. This body has to be burnt into ash some day. Far better it were if, instead of dying through some disease or some worldly calamity, it died as a result of unbearable agony at separation from Rama. That would have made my life worth while. That would have made my fame ever-lasting; earning that fame is enough compensation for all the ills of life." "No, Sumanthra," he said to himself. "Had you the good luck, you would have stuck to Rama; when bad luck haunts you, what else can you do than come away and be alive? Of what use is it now to pine and blame yourself?" Sumanthra chided himself most mercilessly, in this strain. He started again the dialogue with himself. 'With what face am I to present myself in Ayodhya? When the citizens ask me where Rama is, what can I answer? When they ask me, 'how could you come away leaving Rama in the jungle,' what can I tell them? Will I not be overwhelmed by shame and sorrow? O, my heart has become stone. Else, why has it not split into fragments at all that I have gone through?" Sumanthra was disgusted at his own meanness, he wrung his hands in despair. He decided that he should not enter the City during the hours of sun-light, when people would be moving about. It would be less humiliating, he felt, to enter the City at night, after every one had gone to bed and was fast asleep. At last, he reached the bank of the Thamasa River. So, he decided to spend a few hours there, allowing the horses to graze a bit and himself preparing for the entry into the City after nightfall, when the people would not be about the streets, but would be safe in bed. Finally, the chariot rolled into the gate of the City and began to move through thoroughfares. Sumanthra took extra care to ensure silence from wheel and hoof; the chariot moved at the pace of a snail. But, who could silence the agony of the horses? They recognized the streets through which they had taken Rama; they groaned aloud at their present fate, when their dear Rama was far, far away. The populace of the City heard this pathetic neigh; their ears were set to hear this piteous cry; they told each other that Sumanthra had returned with an empty chariot; they ran into the street and stood pathetically on both sides to witness the sad spectacle. Sumanthra bent his head low, when he saw the crowds. Seeing him in this pitiable posture, they guessed that Rama had not returned, and swooned on the spot, falling wherever they stood. Many wept aloud. The residents of the palaces of the Queens, when they heard the neighs of the grief-stricken steeds, sent maids in haste to inquire why; they hurried in groups towards Sumanthra and showered questions on him. He sat dejected and crestfallen, like a mute person, unable to find words to tell them the answers. He sat unmoved like a broken pillar, as If he was deaf and could not hear what they were so earnestly asking him. From his behaviour, the maids inferred that Rama had rejected all importunities to return. They lamented, "O Minister! Have you left Sita in the terror-striking forest, and come back yourself, alone?" and broke into a sudden sharp wail. One maid was more courageous than the rest. She told Sumanthra that Kausalya had ordered that he should come straight to the palace where she was. There Sumanthra found the Emperor prostrate on the floor, exhausted without sleep or food, in disheveled clothes. Sumanthra mastered the surge of sorrow within him, and uttering the words "Jai! Jai", which are traditionally to be pronounced first in the imperial presence, he stood by, shaking head to foot. Recognizing that voice, Dasaratha sat up quick, and plaintively asked him, "Sumanthra! Where is my Rama?" Sumanthra clasped the Emperor in his arms; the Emperor clung to him as a drowning man clings to a blade of grass. Seeing both of them weeping on account of immeasurable sorrow, Kausalya was submerged in grief; she could scarce breathe; she gasped and was pitifully suffocating with agony. The maids noticed this and, themselves loudly lamenting the misfortune that had overtaken all, they struggled to console the queen and restore her. Meanwhile, Dasaratha pulled himself up a little; he made Sumanthra sit right in front of him; he asked him "Sumanthra! Tell me about my Sita and Rama. Tell me all about them. How is Lakshmana? Alas, tender Sita must indeed be very much tired. Where are they now? Tell me". Noting that Sumanthra was not eager to reply, he shook him by the shoulders and pleaded most piteously. Sumanthra was too full of shame to look the Emperor in the face; he bent his looks towards the floor, and with eyes streaming with tears, he scarce could speak. Dasaratha continued his sobs. He said, "O Rama! My breath is still lingering on in this frame, even though a son like you left me. The world has no sinner equal to me in heinousness. Sumanthra! Where exactly are my Sita, Rama and Lakshmana, at present? Take me without delay to the place where they are. Do me this good turn. Fulfill this desire of mine. Without seeing them, I cannot live a second longer". And, like a person infatuated and desperate, he shouted in pain, "Rama! O Rama! Let me see you at least once. Won't you give me the chance to see you? The maids standing outside the hall where he was lying could not sleep or take food, since they were sunk in sorrow at the Emperor's plight. Sumanthra replied, "Imperial Monarch! Rajadhiraja! You are extremely wise; you are made in heroic mould; your abilities are profound. Your lineage is divine. You have always served ascetics and saints. You know that as night follows day and day follows night wealth and want, happiness and misery, nearness and separation come one after the other, with a certain inevitability. Only fools are carried off their feet in joy when happiness comes and are dispirited, down-hearted when misery comes. Learned men like you should not be affected by either; they should be full of equanimity, what ever might happen. I have no credentials to advise you to face this situation courageously for, you know the need for courage very much more. O Benefactor of the World! Heed my prayers. Give up this grief. I shall describe the details of my journey with them now. Please listen calmly." At this, Kausalya struggled to raise herself up, with the help of the maids; she leant on them and made herself ready to listen to what Sumanthra had to say. Sumanthra began, "O Master! The first day we journeyed up to the bank of the Thamasa. Sita, Rama and Lakshmana bathed in the river and after drinking water, they rested under a spreading tree. The next day, we reached the Ganga River. Darkness was invading from all sides. I stopped the chariot according to the command of Rama. All three bathed and rested on a stretch of sand. When dawn broke Rama asked Lakshmana to bring him the juice of the banyan tree, and when he did so, Rama applied it on his hair and matted it, so that he could wear it on the crown of his head. Meanwhile, the ruler of the Nishada tribe, a friend of Rama, brought a boat; Sita was made to get in to the boat first; after her, Rama sat in it; later honouring the order of Rama, Lakshmana entered the boat, carrying the bow and arrows. Ere he sat in the boat, Lakshmana came to me and asked me to convey prostrations and homage to the parents, and his prayer for blessings. He also directed me to request you to put up with things boldly and wisely." 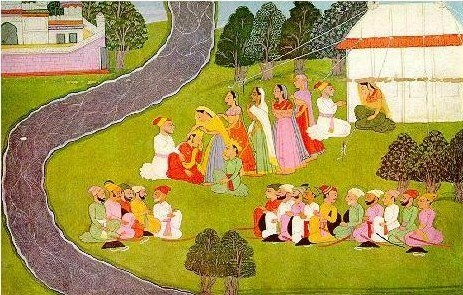 "While Rama was engaged in commissioning me thus, Sita too approached and told me to inform you she was happily spending time with Rama with nothing wanting. She wanted me to offer her prostrations at the feet of her father-in-law and mothers-in-law. She wanted me to tell them not to be anxious about her and to be assured that she was happy with her lord, and eagerly expecting them to bless her always. She requested me to tell them that she inquired often of their health and welfare. "Meanwhile, the boatman realized that it was Rama's wish that he should not delay any longer; so he started to dip the oar in the river. Soon, Rama moved off. I was looking on at the receding boat, with my heart literally petrified; I must have spent a long time standing there on the river bank. I had to return perforce to this place to carry out the orders of Rama; else, I certainly would have drowned myself in the Ganga; I had become so desperate. I had to continue my life, just for this purpose - to convey to you the message from Rama. This Ayodhya which has no Rama in it appears to me forlorn and fearful as a forest." Listening to the words of Sumanthra and the soft sweet messages from Rama and Sita, Dasaratha could not restrain his anguish; he could not forget all that had happened; he fell in a faint. The Emperor's breath was suffocated, like a fish which struggles to wriggle out of the dense slush into which it has fallen. Seeing his plight, the queens burst into heart rending wails. Words cannot describe that moment of desperate distress. Seeing their sorrow, even sorrow could not restrain its own sorrow. The agony of the queens, the agony of the Emperor, the agony of the maids of the palace, spread confusion and consternation over the entire City. The residents of the Capital scattered in terror, just like birds of the forest, frightened at midnight by a sudden thunderbolt. Like a lotus stalk which, plucked and thrown out of the water, fades fast, the Emperor was fast leaving the body. Words could not emerge from the throat, the tongue became dry. The senses turned dull and ineffective. Kausalya watched the Emperor and she noted that the Sun of the Solar Dynasty was setting. She mustered courage and stepping near, she placed the head of her lord on her lap and tried to make him listen to a few words of consolation and comfort. She said, "Lord! Sita, Rama and Lakshmana will be arriving soon and seeing you. Hear my words; take courage; strengthen yourself". When she so compassionately prayed into his ear, Dasaratha opened his eyes, and muttered audibly, "Kausalya! Where is my Rama? Show me, show me, where is he? Take me to him. Alas! My sweet and tender daughter-in-law is not here now. And, Lakshmana, where is he that I don't see him here". Dasaratha bent his head, unable to hold it up any more. The burden of grief was so heavy. A few minutes later, the Emperor remembered the curse that was pronounced on him by the blind hermit, the father of Sravana. He sat up with a struggle, and began telling Kausalya in feeble accents, the story of that curse. "Kausalya! On one occasion, I had gone into the forest on a hunting expedition. A large number of soldiers and huntsmen followed me thither. We could not meet any wild animal the whole day; but, I felt that I should not return to the Capital with empty hands, with nothing bagged. We entered the forest in the night, and waited and watched for some luck. The dawn was about to break into the darkness around us on the brink of a vast lake, when something moved on the edge of the water. I could also hear the sound of the movement. "I inferred that it was a big beast of the jungle, and since I could shoot the arrow straight at the sound and effect a kill, I drew my bow and let go the sharp, sure arrow. It flew fast and furious and hit that animal already on the move. Suddenly, I heard the cry of pain, 'Ah', emanating from the place where it fell. I ran forward with the soldiers and lo, I found it was not a beast I had killed; it was the young son of a hermit! I bent by his side and prayed that he should pardon me, for the tragic error. The son of the hermit told me; 'Emperor! Do not grieve. Fulfill this request of mine, the request I shall presently tell you; that will be enough requital for the sin you have perpetrated. My name is Sravana. My father and mother are both blind. I was spending the days of my life serving them both; that service was granting me all the happiness I needed. I was blessed with even the highest knowledge, the Realization of the Reality. They are now suffering from excruciating thirst. I came here to this lake to take some water to them. You shot at me imagining me to be an animal of the forest. Who can avoid the decrees of destiny? My present condition is such that I can no longer walk with this water to my parents. Therefore, take this vessel of water with you to them; go in the northerly direction, until you come to a lonely thatched hut, and, after they have slaked their thirst, describe what has happened to me here. Not tell them anything about me before they slake their thirst". Saying this, he placed the vessel in my hands, and passed away. Kausalya! O, how pathetically anxious he was for his parents! He never worried about his life which was fast ebbing away; he did not speak a harsh word to me; those soft sweet loving words he uttered are still echoing in my ears. With his last breath, he repeated the sacred Pranava, Om, Om, Om, clearly, three times. Seeing him and his calm courageous death, I decided that I should make amends for my sin by fulfilling his last desire. I hurried to the hut he had mentioned, and gave the vessel into their hands, without uttering a single word. But, those parents started asking many questions; they inquired, 'Son! Why did you take so much time? Why this delay?' They moved their hands forward and waved them about, so that they may touch him, and feel his presence before them. I stepped back a little; meanwhile, the aged couple, wailed, 'Son! Why is it that today you are not speaking to us? We shall not drink the water that you have brought unless you talk to us and answer our queries! "I had directed, that the body of Sravana be brought behind me by the soldiers to the parents' hut. They arrived at this time with the corpse. I placed the body within reach of the mother. She wept most pathetically over the body; I could not look on. Some time later, the mother established some little mastery over her grief and told me, 'Emperor! There is no use extending our lives hereafter, since our son has left us. We have grown old; who will serve us and foster us? Kill us too, as you killed him. Or else, erect a pyre, so that we can immolate ourselves with our son'. I bowed my head, and accepted their command. I heaped dry wood and piled up a pyre. The son's corpse was placed on it. They sat on it and by sheer exercise of Yogic power, they created fire in themselves and burnt themselves. "Before they immolated themselves, they addressed me and spoke a few words. Their holy curse is proving true today." At this point, Dasaratha stopped some time, in order to take rest, and to compose the agitation of his mind. Kausalya pacified him, and gave him consolation and mental calm. She said, "Lord! What did the parents say? Tell me, I am anxious to hear". Dasaratha stayed silent for a while and replied, "Kausalya! What can I say? How can I repeat those words? Those old people, the aged couple, spoke thus: 'You will end your life, as we are doing now, out of unbearable agony at separation from your son'. And then, they breathed their last, amidst the rising flames. "At that time, I had no son; I wondered how their curse would affect me. How could their word come true, I thought within myself. But I also thought, that being the words of an aged sage, they cannot but become true. That meant I must have sons, so that I may be separated from them. You know how sad we were, for we had no sons then. I felt that the curse might prove a blessing; I prayed it may come true, so that, even though I may have to be separated from them, I might have sons. I could not tell you this secret till now. Now, I understand that the words of that holy hermit represented genuine truth. The agony of separation from Rama is bringing about my end. I have recalled to memory the tragedy of Sravana. My courage is spent. I cannot muster it any more." Dasaratha was lost in the contemplation of the incidents of the past. "Rama! Rama! Rama!" he cried thrice, and leaned back on Kausalya. Kausalya noticed the change that had come over him, and screamed. The attendants and maids gathered around. They found that the Emperor had drawn his last breath. The city was turned into a vale of tears, a seething pool of grief. Crowds surged into the palace. The streets became fast-moving torrents of weeping humanity. People cast curses on Kaikeyi, for, they felt that the City had lost its Eyes, as a result of her machinations. Vasishta, the Royal Preceptor, arrived at the Hall, where the body of the Emperor lay. He spoke appropriate counsel and tried to assuage the sorrow of the queens. He consoled Kausalya and Sumitra, telling them about the deceased forefathers and how they too could not escape death, in spite of their might and majesty. Since there was no one present who could officiate during the obsequies, the body was, according to the instructions given by Vasishta, kept immersed in oil so that it might not disintegrate. Vasishta beckoned a courier, and told him. "Here! Go quickly to Bharatha; do not tell him a word about the death of the Emperor; but tell him only this&emdash;the Preceptor wants that you and your brother should return immediately to the Capital City." The courier fell at the feet of the Preceptor, and took leave of the Minister, before he started on the long journey in a fleet chariot. Ever since Ayodhya was plunged in sorrow, Bharatha was experiencing various premonitions in the form of ominous dreams. He was awakened by the terror and turmoil which the dreams presented before him. Many nights Bharatha had not even a wink of sleep. He sat up in bed, in an eerie state of expectation. He feared that some bad news was coming fast towards him. He moved out even before dawn, and, after an early bath, he engaged himself in various rites and ceremonies in order to propitiate the Gods and avert the expected calamity. He sat long in the shrine, praying for relief. In spite of all this, he was haunted by a mysterious fear. The dreams were persisting for fourteen days and so Bharatha had reached the very bottom of his courage and faith. Meanwhile the courier from Ayodhya managed to reach the City of Kekaya, where Bharatha was, on the fifteenth day of his long journey. When Bharatha was informed of his arrival at the main entrance to the Palace, Bharatha ordered that he be brought in immediately, so that he might know what had brought him. The courier prostrated before Bharatha and prayed that he and his brother start without the least delay, according to the command of the Preceptor, to Ayodhya. Bharatha inquired about the welfare of people in Ayodhya, plying the courier with a variety of questions. He replied that there was nothing special to report, except that the Preceptor wanted them to return soon, without delay. This was the task on which he had come and he had nothing more to may. Nor did he know anything more. Bharatha knew that couriers would not speak more than a few words before their royal masters and the royal masters too should not keep on talking to them intimately for long. Etiquette demanded that he should not converse with him for more than a few minutes. The courier too had his code of discipline. So, he rose and left the chamber. That very moment, Bharatha entered the inner apartments, and took leave of his maternal uncle; along with his brother, Satrughna, he got into the waiting chariot, and hurried it to move forward faster and faster. Like an arrow from an intrepid bow, the chariot flew over mountain paths, hill tracks and jungle roads. Grief was surging from Bharatha's heart, as fast as the chariot itself. He could not explain why or wherefore. Some inexplicable agony afflicted him. Bharatha did not wish to delay on the road for food or even for a gulp of water to assuage his thirst.